A fact-filled profile of Edwin and John Wilkes Booth. The sons of a renowned Shakespearean actor, each enjoyed successful theatrical careers, though Edwin was more famous and admired as an actor. They were divided in their sympathies in the Civil War. John Wilkes spied and smuggled in his zealous support of the Confederacy, fantasizing about a plot to kidnap Lincoln before masterminding the assassination. Langston-George notes that the lives of the Lincolns and the Booths intersected multiple times. Robert Todd Lincoln and John Wilkes pursued the same woman, Lucy Lambert Hale, and Edwin Booth saved the life of President Lincoln’s eldest son when he pulled him off the tracks before an oncoming train. President Lincoln had also seen John Wilkes perform at Ford’s Theater. 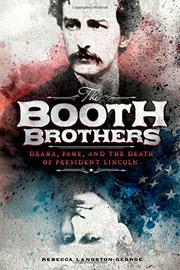 This story of the Booth brothers is sufficiently factual but lacks depth or nuance. Langston-George frequently uses quotes; sources are identified in the endnotes. What drove John Wilkes to embrace the Confederacy and white supremacy and to plot Lincoln’s assassination is not discussed. The emotional and psychological toll his crime took on Edwin is unexplored. A much more engaging, astute, and insightful profile of the Booth brothers can be found in James Cross Giblin’s Good Brother, Bad Bother (2005).